Earlier this month, I made a brief visit to the newly opened Hard Rock Casino in beautiful Atlantic City! The place was very crowded, as it had only been open less than two weeks at the time, so I didn't stay very long. You could spend all day combing the walls, which are adorned with various pieces of rock memorabilia like guitars and outfits. However, the above mural took the cake. Springsteen has previously been sneaky in his Atlantic City appearances, but there's no missing this masterpiece. 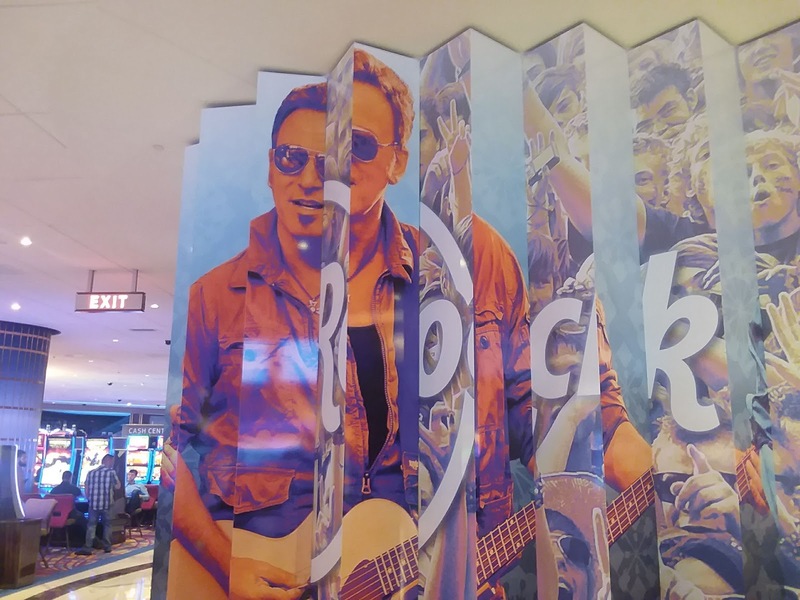 I'll have to go back soon to do a proper hunt for more Springsteen-ness within the Hard Rock Casino. Seeing as fellow blog writer OB stayed on a Bon Jovi themed floor, I'm sure there's plenty more out there.